The folding system ... used in various private homes. “Another factor for this product’s success is its ability to maximise space considerably both visually and physically,” Khalaf adds. He says Reynaers Middle East has acquired steady business for this variety of sliding units since its launch and expects to witness increasing sales in the near future for this product range. “Judging by the current inquiries and demand experienced for this particular product range, there is no doubt the CF 77 can easily be classified among the most sought-after Reynaers systems,” he comments. Dragon Restaurant, Kuwait ... CF 77 folding doors installed. The CF 77 is supplemented with a slim-line variant, the CF77-SL, which has a narrower visible width. The standalone solution comprises new profiles, accessories and insulation technologies that have specifically been designed for folding systems. It ensures high insulation values (Uf values of up to 2.22 W per sq m K and Uw up to 1.68 W per sq m K with an Ug of 1.1 W per sq m K for a three-panel configuration measuring 2,700 by 2,300 mm) that meet stringent legislation requirements as well as market demands well into the future, Khalaf points out. The CF 77 allows substantially transparent constructions with a maximum height of 3 m and vent width of up to 1,200 mm, allowing vent weights of up to 120 kg. Different designs in handle options are also available. An optional door-locking principle allows users to use the first leaf either as an entrance door or as a window without impacting the folding capability of the system, he adds. “With the CF 77, there’s a broad variety of configurations to choose from. Its versatility allows fabricators the benefit of installing the system to open either inward or outward with the same profiles and accessories. 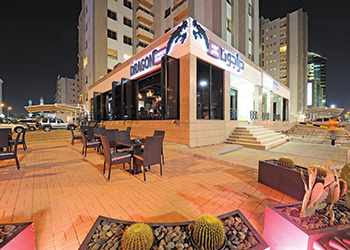 With its limited number of profiles and innovative locking mechanism, the system can easily be adjusted and assembled on site,” says Khalaf. A cross-section of a CF 77 variant. 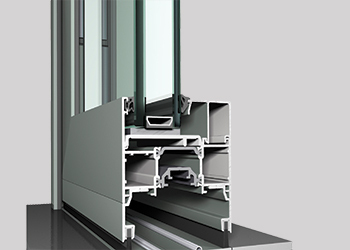 The CF 77 solution, with its 77-mm building profile depth, is fully compatible and can be integrated with most existing Reynaers systems and solutions in the windows and doors as well as curtain-walls product range. The system is available in three different door sill solutions: the flat bottom solution allows for easy entry/exit and maximum convenience for high traffic; the low threshold option offers a rise of only 18 mm; and the high-performance option achieves maximum performance in terms of air, wind and water resistance. 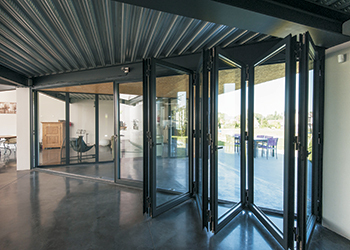 Internationally, this series of sliding systems has been used in various striking projects like the Olone Sur Mer tourist office in France and several luxury houses like the Anstaing and the private house in France. Reynaers Aluminium is a leading European provider of innovative and sustainable architectural aluminium solutions. These include a wide variety of window and door systems, curtain-walling, sliding systems, sun screening, conservatories, skylights, screens and systems to incorporate blinds and ventilation grids. Established in 1965 and with its headquarters in Duffel, Belgium, Reynaers Aluminium has offices in more than 30 countries worldwide.